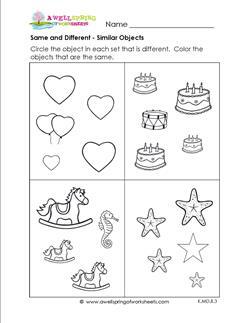 In these same and different worksheets children identify the objects that are exactly the same and those that are different, as well as determining which object is different among identical objects of differing sizes. From the seas to the stars, children will enjoy circling the objects in these unique themed worksheets. Then kids can get out those crayons (or colored pencils, or markers!) and color in the objects. Hoppers, cluckers, and nose twitchers are the subjects of this same and different worksheet. 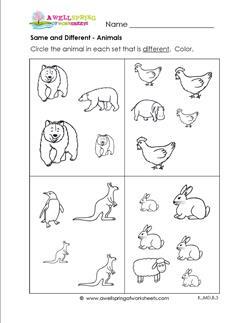 Simply circle the animal in each set that is DIFFERENT. Color. Same and Different – Name That Fruit! 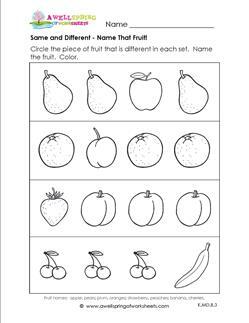 Apples, peaches, plums an more grace this same and different worksheet. Circle the piece of fruit that is DIFFERENT in each set. Name the fruit. Color. 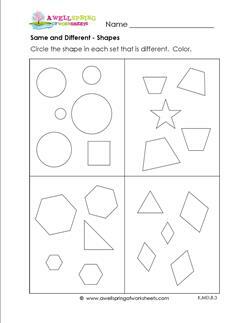 Circles, squares, diamonds and hexagons come all together on this same and different worksheet. Circle the shape in each set that is DIFFERENT. Color. 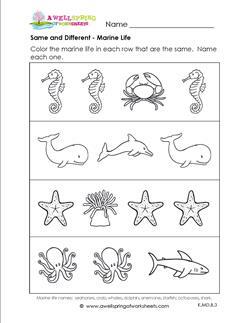 This same and different worksheet has four sets of marine life - whales, seahorses, starfish, and more! Color the marine life in each set that are the SAME. This same and different worksheet has four sets of objects that are similar in one way or another. Color the objects in each set that are the SAME. 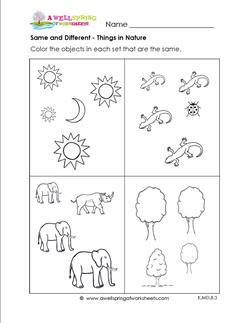 From the sun and moon to the trees, to big and small creatures, this same and different worksheet has it all! Color the objects in each set that are the SAME.